Bangladesh will face two enormous challenges in the coming decades: food security and climate change. The remarkable growth in agricultural productivity achieved over the last 30 years through intensification and diversification of crop production is not likely to continue. Already, 45% of the 160 million people in the country are estimated to be consuming less than their daily calorie requirements; 53% are also estimated to be living below the poverty line. With a population density the highest in the world for an economy occupying a large land area, Bangladeshi farm sizes are, on average, smaller than 0.1 hectares, and even triple-cropping of land under irrigation does not result in adequate incomes. Efforts to manage irrigation more efficiently, to protect and use wetlands for fisheries, and to exploit mangrove areas for intensive shrimp-production have helped to increase resource productivity, but the sustainability of these efforts, especially in light of projected impacts of climate change, is in question. Bangladesh has made significant strides in flood prediction and disaster preparedness in recent years, but the country’s location in the floodplains of three major rivers makes it especially vulnerable. Projected changes in river flows and freshwater availability, surface drainage congestion and inundation, sea-level rise and salt water intrusion, increased floods, and coastal storms pose significant risk. Some analysts believe these changes are likely to have a major impact on both urban and rural areas, affecting living conditions as well as agricultural activities. To address the twin challenges of food security and climate change, Bangladesh and its external partners will need to address land and water issues more aggressively. Incentives for expanding non-agricultural sources of employment are needed, as well as measures that will enable those remaining in the agricultural sector to maintain productivity levels and achieve higher rates of labor productivity. More rational and equitable use of the state-owned khas land could, as suggested by many analysts, be a part of this transition. More security of tenure, through registration and/or titling of land as well as through more transparent and fair dispute-adjudication procedures, may be essential for flood-control structures to be improved as well as for growing urban areas to provide healthy and safe environments for families and businesses. Land rights are insecure in large measure because of an inefficient, expensive, and corruption-prone system of land titling and registration. USAID’s work on governance and economic growth in Bangladesh provides a possible foundation to support Bangladesh’s Land Use Policy, the goal of which is to streamline land transactions and registration and to reduce corruption. Donors’ support could assist the exploration of options for incremental land tenure in urban and peri-urban areas, the design of the land transfer and registration system, comprehensive institutional- and capacity-building and targeted support for registering the land rights of the poor (including homestead rights). USAID’s involvement in community-based agricultural development and environmental management efforts may provide a starting point for donors to expand support for community-led initiatives for improving land access and tenure security with the goals of increasing food security, incomes, and sustainability. Interventions at the community level could also draw on donors’ and NGOs’ expertise in gender equality and promoting women’s rights by ensuring that women’s land rights are respected and improved. Despite legislative land reforms initiated since independence in 1971, land distribution in Bangladesh is highly inequitable. Fifty-two percent of the rural population, which accounts for almost 75% of the country’s population, is landless or holds less than .5 acres of land. Agricultural productivity has been increased over the past three decades by substantial intensification of production, both through the use of new technologies and by greater intensity of land use. Nevertheless, the amount of land available for cultivation by each household is declining and the number of landless households is rising. The population of urban areas is also expanding, with the poorest households squatting on public land or living in informal settlements with no security against eviction. Dhaka is among the ten most populous cities in the world, and the percentage of Bangladesh’s urban population living in slum conditions is the second-highest in South Asia. Given Bangladesh’s location in the floodplains of three great rivers, the country is prone to flooding. Climate change analysts now predict that the extent and levels of flooding are expected to increase in the future, greatly affecting agricultural productivity. The country’s water resources are polluted by agricultural, industrial and domestic waste, and its groundwater is contaminated with arsenic. With the exception of a few natural springs, Bangladesh has no potable surface water. Forestland accounts for less than 7% of total land area in Bangladesh. Deforestation, resulting from illegal logging, resettlement of people, natural disasters, extraction of resources, and encroachment for agriculture, is a constant threat. People also rely on forest resources for fuel, construction materials, fodder and food. Forestland per capita in Bangladesh is among the lowest in the world. In 2008, Bangladesh’s total land area of 144,000 square kilometers supported a population of 160 million people. Seventy-three percent of the population lives in rural areas. Agricultural land made up 70% of land area in 2003–05, while urban land accounted for between 8% and 20% (GOB data varies). The amount of land available for cultivation is declining, and 60% of Bangladesh’s landowners cultivate one acre or less (World Bank 2009a; ADB 2004c; IMF 2005; GOB 2005; GOB 2010). Bangladesh had a total GDP of US $79 billion in 2008, with 19% attributed to agriculture, 29% to industry, and 52% to services. In the 2003–2005 period, the agricultural sector comprised 52% of national employment (World Bank 2009a; ADB 2004b). Approximately 7% of Bangladesh’s territory is forested, and the rate of deforestation is 0.3%. Protected areas make up 0.7% of Bangladesh’s land area (World Bank 2009a). Bangladesh is prone to annual flooding, with 80% of the country’s land area within floodplains. The remaining area consists of hills (12%) and terraces (8%). High-intensity cropping techniques, soil and riverbank erosion, and loss of wetlands resulting from flood control, drainage and irrigation projects are causing substantial land degradation (ADB 2004b). Dhaka City’s land area, according to the government, was approximately 229 square kilometers in 2005, and the city’s population density was 8573 persons per square kilometer. Land use is mixed in the city, where formal and informal housing settlements crowd into space shared by industry (especially textile, dyeing, washing and garment), shopping centers, schools and small-scale business. Since the early 1980s, both housing and industry have built up rapidly and without significant planning, claiming agricultural land, wetlands and water bodies as the city sprawled outward. Due to the lack of land-use planning, much of the land in residential areas is severely contaminated with heavy metals and solid wastes from industry (GOB 2005; UNEP 2005). The government adopted a National Land Use Policy in 2001, which sets forth guidelines for improved land- use and zoning regulations. Issued by the Ministry of Land, this document recommends: (1) stopping the high conversion rate of agricultural land to non-agricultural purposes; (2) utilizing agro-ecological zones to determine maximum land-use efficiency; (3) adopting measures to discourage the conversion of agricultural land for urban or development purposes; and (4) improving the environmental sustainability of land-use practices. In a 2004 Actionable Policy Brief, the government acknowledged difficulties in implementing the National Land Use Policy, which it attributed to the dispersion of land administration authority among many different ministries (GOB MOA 2006). Bangladesh has a long history of inequitable access to land. In rural areas, one percent of landowners own more than 7.5 acres. Ten percent of landowners own between 2.5 and 7.5 acres. The remaining 89% of landowners own less than 2.5 acres. Thirty-nine percent have less than .5 acres. This inequity exists despite a series of land reforms in the 1950s and 1960s that included tenancy reforms, imposed ceilings on landholdings, and provided for the distribution of public land to the landless (GOB BS 2008; Uddin and Haque 2009). Thirteen percent of rural households in Bangladesh own absolutely no type of land, including for housing, and the number of landless households is growing. Thirty-one percent of rural households rely on agricultural labor as their main source of income. Land is a prerequisite for social, economic, and political power in Bangladesh. Because land is scarce, establishing ownership rights is highly competitive and can lead to violence (GOB BS 2008; ADB 2004c; IMF 2005; ANGOC 2001). Expanding urban boundaries, rural- urban migration, and urban population increases are combining to create high rates of urban growth in Bangladesh. Land prices are high in urban areas, and formal land transactions are dominated by the wealthy. The poorest households most often squat on public land or rent living quarters on the informal market. In Dhaka City, overcrowding is severe among poor and middle-class families, and the distribution of land reflects a high degree of socioeconomic disparity. Seventy percent of the population lives on only 20% of the residential land in the city, while 30% of the population lives on 80% of the land (Shafi and Payne 2007; CPD 2003; UNEP 2005). Indigenous people, largely living in the Chittagong Hill Tracts, represent more than 27 groups and make up roughly 1.5% of Bangladesh’s population. The indigenous groups most commonly hold land in indigenous areas under principles of customary law. Bengali settlers moving into the indigenous areas often fail to recognize indigenous rights, and indigenous people often lack the resources and capacity to defend their rights effectively. According to the 1991 Census, Bengali settlers make up 48.6% of the population (MRGI 2008; Roy 2005). The Constitution of the People’s Republic of Bangladesh, 1972 (amended 2004), provides that all citizens shall have the right to hold, acquire, transfer and dispose of property (GOB 1972). Key land-related legislation includes: Transfer of Property Act of 1882; Registration Act 1908; Non Agricultural Tenancy Act of 1947; State Acquisition and Tenancy Act of 1950; Acquisition of Waste Land Act of 1950; Bangladesh Land Holding Limitation Order of 1972; Land Reforms Ordinance of 1984; Land Reform Board Act of 1989; and the Chittagong Hill Tract Regulation Act of 1990 (ADB 2004b; Shafi and Payne 2007). The State Acquisition and Tenancy Act of 1950 established a 33-acre land ceiling on private landowners, with the excess transferred to the government upon payment of compensation. Local government was charged with transferring the surplus land to the landless. The Land Reforms Ordinance of 1984 placed a 21-acre ceiling on acquisition or holding of agricultural land and invalidated benami transactions, in which a person purchases land in the name of another so as to evade the land ceiling. Neither land ceiling law has been widely implemented (ANGOC 2001; Uddin and Haque 2009). The 1984 Ordinance also provided greater tenure security to sharecroppers (bargadars) in sharecropping contracts with landowners, and prohibited the eviction of agricultural tenants from homestead land (Uddin and Haque 2009). Customary rights and practices are, to a limited extent, recognized throughout Bangladesh with respect to personal laws and simple civil matters. The Chittagong Hill Tracts (CHT) region, which is the principal home of the country’s indigenous people, has a separate legal regime that blends customary and formal law. Principles of land administration codified in formal law are inapplicable in the CHT region. Instead, customary law enforced by traditional institutions governs areas of personal law and natural resource use, including land. Official government institutions maintain but rarely exercise concurrent jurisdiction (Roy 2004). Land in Bangladesh is owned either by private individuals and entities or the state. The three most common private tenure types in Bangladesh are: common law freehold (exclusive ownership of land for an indefinite period, estimated to apply to 69% of agricultural farm landholding in 2005); ninety- nine-year use rights to government land (khas) that has been distributed to landless families; and leaseholds (the right to use land owned by another for a fixed period). Leases for agricultural land include both cash and sharecropping arrangements (Shafi and Payne 2007). Cash leases and sharecropping. Cash leasing agreements range from one to 99 years. About one-third of all rural households lease in land, with sharecropping constituting the most common arrangement. Sharecropper contracts must be for 5 years and are heritable. The sharecropper and the landowner each receive one-third of the crop; the remaining third is allocated based on each party’s share of the costs. The sharecropper has a right of first refusal to purchase the sharecropped land at market price (Uddin and Haque 2009; Shafi and Payne 2007; Anwar 2006). Government land. Government-owned land may be owned by government bodies, public agencies, or government-owned corporations. The Ministry of Lands has authority over khas (public) land, which includes surplus land that violates the land ceiling law, and other land owned historically by the state throughout colonial and Pakistani rule. The Ministry of Lands is responsible for allocating khas land to the landless; however, corruption and lengthy procedures have limited land allocations. The country also has a percentage of wakf land, which is held by the state and administered by the Department of Waqf for religious purposes (Shafi and Payne 2007; GOB DOW 2008). Individuals acquire ownership-rights to land through purchase, inheritance, or gift. Titling and registration of land ownership is set out in the Transfer of Property Act 1882 and Registration Act of 1908. Procedures are expensive and complex, as detailed below. Thirty-nine percent of rural households access land through various tenancy arrangements, including term leases and sharecropping. Sharecropper tenancy has declined, while fixed-rent tenancy and medium-term leasing arrangements have increased. In practice, most land- tenancy agreements are conducted verbally, although the Registration Act of 1908 sets out a process for registered leaseholds. Under the Land Reform Law adopted in 1984, agricultural households already occupying farmlands obtained rights to their homestead land through an anti-eviction provision (Uddin and Haque 2009; Shafi and Payne 2007). Land-grabbing occurs when encroachers on public lands create false documents and get court decrees to confirm their ownership. Most land-grabbers are influential persons who get land-administration and management departments to assist them in forging documents. 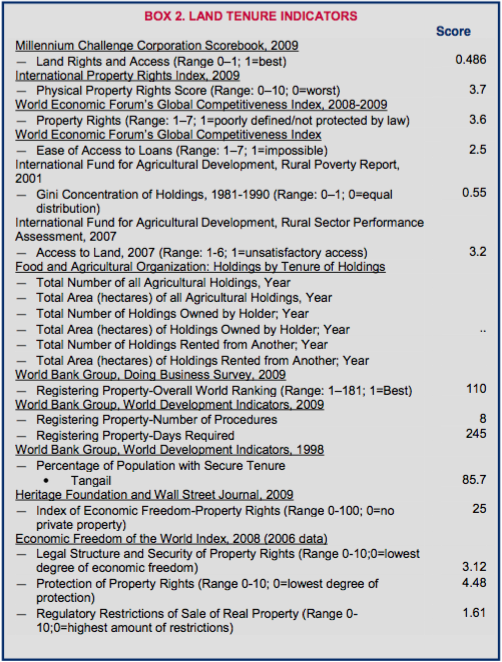 Statistics differ widely about the percentage of land acquired through land-grabbing; it is likely significant, however (Uddin and Haque 2009). The government maintains a khas land allocation program that grants landless households 99-year rights to plots between one and three acres (depending on land quality) at no cost. The distribution of khas land to landless households entails a lengthy process, and applicants for land often must pay bribes at several of the steps. In addition, ineligible persons may be in possession of the allocated land, leaving the beneficiaries of the land-allocation relatively powerless to assert their possession-rights(Shafi and Payne 2007; Uddin and Haque 2009). The majority of urban residents access land through the informal market where land rights are neither registered nor transferred according to the requirements of the law, or by squatting on public land. Bangladesh has the second-highest percentage of urban residents living in slum conditions in the region. These urban residents live in substandard conditions, and even those who have occupied the land for decades are vulnerable to large-scale evictions by the government, and to abuse and oppression by landlords (Shafi and Payne 2007; World Bank 2006b; UN-Habitat 2007). Cumbersome and expensive registration requirements impede formal-sector land transactions. An individual or entity (either domestic or foreign) purchasing a real estate plot in a peri-urban area near Dhaka City can expect to pay 10% of the value of the property for registration, which takes 245 days and requires 8 different procedures. These include: (1) verifying the record of rights from the Land Office (also known as the Land Revenue Office); (2) conversion into the current survey of property titles created before the last cadastral survey; (3) obtaining inspection for this conversion (mandatory only on some properties); (4) obtaining a non- encumbrance certificate from the relevant sub-registration office (such as the Municipal Deed Registration Office); (5) preparing the deed and paying the stamp duty; (6) paying capital gains tax, registration fee, VAT, and other taxes; (7) applying for registration at the relevant sub-registration office; and (8) registering the change in ownership at the Land Office. The World Bank rates Bangladesh 119th out of 183 countries on the Ease of Doing Business scale, and 176th out of 183 countries on the specific issue of property registration (World Bank 2010a; World Bank 2006b). The Constitution of Bangladesh provides that all citizens are equal before the law and entitled to equal protection of the law, which prohibits discrimination on the basis of gender. Despite these pronouncements, women in Bangladesh rarely have equal property rights and rarely hold title to land. In 1996, only 3.5% of agricultural land was titled in the name of a woman. Fewer than 10% of women have their name included on any documentation of property rights. In rural areas, women access land almost exclusively through their relationships with male family members such as husbands, fathers, or brothers (GOB 1972; Kamal 1988; ADB 2004a; World Bank 2008a). Ninety percent of Bangladesh’s population is Muslim. Islamic law and traditional practices govern matters of personal law such as marriage, divorce, and inheritance. Under Islamic law, a female child generally inherits half the property inherited by a male child, and a widow receives between one-eighth and one-fourth of her deceased husband’s estate, depending on whether they have children. Laws such as the 1961 Muslim Family Laws Ordinance, the 1985 Family Court Ordinance, and the 1974 Muslim Marriage and Divorce Registration Act have provisions that are often more favorable toward women than traditional Islamic principles. However, Bangladeshi women have difficulty using the law to protect their land rights due to inadequate resources, lack of knowledge of the law and legal processes, and cultural norms (Kamal 1988; ADB 2004a). Rural women often provide the primary labor on household land and are severely affected by land loss caused by frequent flooding and erosion. Subsistence and income-producing crops are regularly lost, and women usually cannot receive compensation for losses because the land is rarely registered in their names (ADB 2004a). The Ministry of Lands is entrusted with land administration and management, settlement of the government- owned lands (khas), and vested and abandoned properties. The Ministry is responsible for land acquisition, collection of land development tax, and land surveys, and is responsible for record-keeping, overseeing land- use planning, implementing land reforms, and managing government land development programs (GOB 2009; Shafi and Payne 2007). The Ministry of Lands acts through the Directorate of Land Records and Surveys (DLRS) and the Land Reform Board (LRB). The highest revenue court in the country is the Land Appeals Board. The Board has final authority over matters relating to public land, taxation, and other issues that cannot be determined by lower authorities. The Department of Land Registration in the Ministry of Law, Justice and Parliamentary Affairs records land transactions and collects the Immovable Property Transfer Tax (GOB 2009). The Ministry of Agriculture is primarily concerned with development, planning, and monitoring of agricultural policy. The Bangladesh Agricultural Development Corporation is responsible for project delivery (FAO 1999). The Capital Development Authority of Bangladesh, RAJUK, has responsibility for development, planning and land-use management in Dhaka City. RAJUK has an acquisitions department to procure land for development projects, which include construction of roads and transportation facilities, as well as development of private housing complexes and new townships (RAJUK 2010). In the Chittagong Hills Tracts (CHT) region, authority over land matters is shared by the central government and the traditional institutions. The central government operates through its district and sub-district offices; traditional village heads or chiefs (karbaris), the headmen responsible for several villages (mauza) and paramount chiefs or chiefs of revenue circles (rajas) have traditional and practical jurisdiction over natural resource management and land and revenue administration (Roy 2004). Both rural and urban land is scarce in Bangladesh, and land prices are rising. Under formal law, land sales, leases of a year or more, and land received through inheritance must be registered. Land registration requires 8 procedures and an average of 245 days to complete. The total cost of the transaction averages 10.4% of the value of the property. As government approvals are necessary at various levels, those seeking such approvals are subject to demands for bribes. The time and cost required to participate in the formal land market drive most land transactions into the informal sector (Uddin and Haque 2009; Khan 2009; Shafi and Payne 2007; World Bank 2009b). The Board of Investment of the Bangladesh government estimates the average price of developed land in industrial belts to be between US $10 and $15 per square meter, depending on location. The average cost of construction on this land is between US $100 and $125 per square meter (GOB BOI 2010). Article 42 of Bangladesh’s Constitution provides that land can be acquired, nationalized, or requisitioned upon authority of law and with compensation. The Acquisition and Requisition of Immovable Property Ordinance, 1982, permits government land-acquisitions as needed for any public purpose. Compensation is limited to persons who are listed as owners in the land administration records. Providing proof of ownership is a lengthy process and landowners are unlikely to receive market value for seized land (GOB 1972; DWSA 2008). The process of expropriation or land acquisition has historically been problematic. A 1992 survey of households that had lost land to governmental acquisition for six different flood-control projects uncovered significant problems including poor compensation, low land-valuation, delayed land payments, litigation charges, and the requirement of bribes. More recently, the government plans to acquire land from 3457 families for construction of the Padma Multipurpose Bridge Project in Munshiganj District. Also, the Capital Development Authority (RAJUK) plans a number of development projects in Dhaka City in the near future, but the extent to which these will require acquisition of private land is not clear (UNESCAP; Rashid 2009; RAJUK 2010). Land disputes, fueled by the scarcity of land and the critical role land plays in rural livelihoods and status, are common in Bangladesh. According to the World Bank, “[T]he overwhelming majority of both civil and criminal cases filed in the court system emanate from disputes over land and are linked to the system of land registration[. ]” The most common causes of land disputes are issues regarding the distribution of khas land to ineligible households, possession of government-allocated land by ineligible persons, and encroachment by the politically powerful and by local elites on public land inhabited by landless people. In the Chittagong Hill Tracts regions, the migration of settlers onto land held by indigenous people under customary law has caused ongoing conflict, which has recently elevated (Roy 2005; ANGOC 2001; World Bank 2010b; CARE 2003; Uddin and Haque 2009; ISN 2010). Disputes relating to the registration of land titles fall within the jurisdiction of the Ministry of Land. Some disputes are resolved before an informal dispute resolution body called a shalish, over which influential local leaders preside. Disputes that enter the formal dispute resolution system begin before a local-level official (the tehsildar) and can proceed simultaneously through the administrative dispute resolution system and the civil court system. Land cases may take 15–20 years to resolve, and few but the wealthy can afford the time and money to enforce their land rights through the formal system (Uddin and Haque 2009; CARE 2003). In the Chittagong Hill Tracts region, traditional institutions led by karbaris (headmen) and rajas (chiefs) have authority to resolve land-related disputes, with the formal courts retaining concurrent (but rarely invoked) jurisdiction. The district and regional councils established as the administrative heads in the region also have adjudicative authority (Roy 2004). Despite land reform efforts, the unequal distribution of land continues to stall progress toward rural poverty- alleviation. The government’s land reforms have largely centered on efforts to redistribute khas land. However, the implementation of the land allocation program has failed to support the legislative intent. Only about 26% of the 3.3 million acres of agricultural khas land has been distributed, and most of the redistributed land has ended up in the hands of the local elite. Elites have encroached on public land and consequently control a large percentage of undistributed land held by the government. The intended beneficiaries of the law have only received an estimated 11.5% of the agricultural land distributed. The results of the government’s other major land reform initiative, the imposition of land ceilings and distribution of surplus land, have also fallen short of expectations. Many large landowners used loopholes in the legislation to retain their land, and local officials lacked the political will to enforce the spirit of the law to benefit of the landless (ANGOC 2001; CARE 2003; IMF 2005). The Government of Bangladesh, in its poverty-reduction strategy paper for the World Bank, recognized the need to improve distribution of khas land and to reduce incidences of land-grabbing. The government also issued a Land Use Policy in 2001, through which it intended to: reform the system of land administration and related laws; preserve and optimize the use of agricultural land; make suitable government-owned land available for development projects; reduce soil degradation; and establish a data bank for various categories of land. The government has since acknowledged, however, that implementation of the Land Use Policy has been difficult (IMF 2005; World Bank 2005; GOB MOA 2006). Under its food security program, USAID works with farmers and households on crop diversification and home gardening techniques. The Asian Development Bank (ADB), the UK’s Department for International Development (DFID), Japan, and the World Bank have developed a joint strategy to support development in Bangladesh that includes improving land administration and land-use planning. The ADB’s 1999 gender strategy for Bangladesh included improving women’s access to land. ADB also has a program aimed at reducing land degradation (USAID 2009; ADB 2004c; ADB 2004a). DFID supports a Land Rights Program managed by NGOs. This program emphasizes land access redistribution and reportedly has benefited 867,000 people (DFID 2007). Almost 300 NGOs, including organizations for peasants and landless people, have joined together to form the Association for Land Reform and Development. Among other things, the member organizations work on issues relating to land rights, rights to food and livelihood, and the rights of indigenous peoples (ILC 2009). Three Himalayan rivers – the Ganges, Brahmaputra and Meghna – converge in Bangladesh to form the world’s largest delta. Almost 80% of the country is considered floodplains. At least 20% of the country floods annually, and 40% of the country floods every few years, destroying crops, infrastructure and housing, and eroding agricultural land. The incidence, extent, and level of flooding is expected to increase in the future as a result of climate change (World Bank 2009a; ADB 2004b; World Bank 2006b). Internal renewable water resources in Bangladesh are estimated at 105 cubic kilometers. The majority of water (96%) is used for agriculture, followed by domestic use (3%), and industrial use (0.7%). Despite widespread flooding, the majority of the rural population experiences water shortages during the dry season (FAO 1999; Gupta et al. 2005; IMF 2005; World Bank 2009a). Although Bangladesh has abundant groundwater resources, these have been compromised by the discharge of pollutants into rivers and canals, and by the contamination of aquifers. With the exception of a few natural springs in the hill areas, Bangladesh has no potable surface water. Discharges of municipal wastewater are so significant as to render the existing water treatment facilities near large urban areas inoperative. In 61 of the nation’s 64 districts, the groundwater is contaminated with arsenic (ADB 2004b; FAO 1999; World Bank 2006b; World Bank 2008c). Bangladesh’s 1999 National Water Policy was drafted by the Ministry of Water Resources as part of the Fifth Five Year Plan. The goal of the Water Policy is to ensure progress towards national goals of economic development, poverty alleviation, food security, public health and safety, a decent standard of living for the people and protection of the natural environment. The Water Policy states that the government should develop a National Water Code to provide a comprehensive legal regime for the development, preservation and allocation of water resources (Gupta et al. 2005). Bangladesh’s integrated water management plan for 2000–2025 addresses three major issues: (1) efficient use of water in the face of increasing scarcity; (2) providing all people with access to sufficient, good-quality water; and (3) ecologically sustainable use of the resource. As of 2010, a draft Bangladesh Water Act, intended to become the national water code, had been prepared by the Ministry of Water, but had not yet been enacted into law (Gupta et al. 2005; GOB 2008). Under the proposed Water Act, unless otherwise provided by law, the state owns all water resources in Bangladesh, including surface water, groundwater, and sea water. Water may be legally appropriated for customary uses, but users must hold a water use-right. Use rights are naturally awarded to individuals for the collection of water for domestic uses, for bathing, and for navigating small watercraft. For other purposes, use rights must be acquired through a general authorization or license (GOB 2008). Water rights are tied to land ownership, and individuals and communities can hold water rights based on their rights to the land. The USAID-sponsored GOB project MACH (Management of Aquatic Ecosystems through Community Husbandry) established community-based co-management of wetlands. State-owned closed water bodies of less than 3 acres in size are subject to common-property principles; poor people living in the area are allowed to access the water for their domestic use. In addition, private individuals may have and control small household ponds (CARE 2003; Gupta et al. 2005; USAID 2006). The rights of riparian owners to receive naturally-flowing water from higher estates or land are guaranteed under the draft Water Act. Riparian owners are restricted from constructing works that will impede the natural flow of water unless they provide an alternative drainage source (GOB 2008). The Ministry of Water Resources is charged with management and development of the water sector. Within the Ministry, the Bangladesh Water Development Board administers flood control, irrigation, erosion control and other water projects. The Water Resources Planning Organization is responsible for coordinating planning for all water resources programs and administration (FAO 1999). The 1999 Water Policy assigns water-allocation decisions to local administrative authorities (Gupta et al. 2005). The Government has undertaken a number of projects to address water-related problems in Bangladesh, including flood control and forecasting, drainage and irrigation projects and disaster management. The government’s water strategy also includes expanding small-scale irrigation projects (Gupta et al. 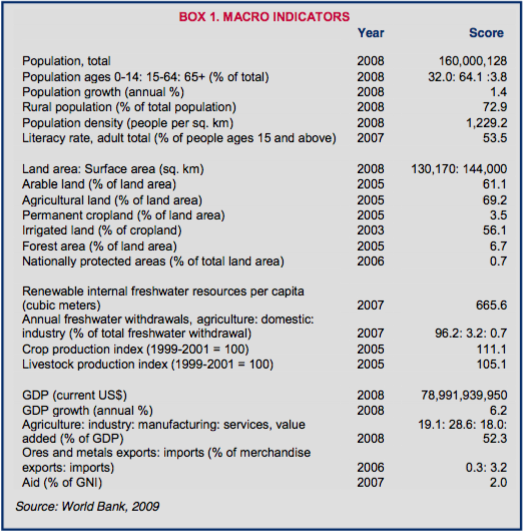 2005; FAO 1999; World Bank 2008c). Implementation of water-related reforms in Bangladesh is plagued by lack of inter-sectoral coordination, conflicts in sectoral policies, lack of institutional capacity, outdated laws and an overall non-punitive approach incorporated into existing law. One objective of the Draft Water Act is to revise and consolidate all the laws governing ownership, development, appropriation, utilization, conservation, and protection of water resources (Gupta et al. 2005; ADB 2004b). In Dhaka, the Dhaka Water Supply and Sewage Authority has worked with the World Bank on a US $165 million project to support sewer systems, improve water drainage, and ensure water and sanitation services to low-income communities (World Bank 2008b). The Bangladesh Power Development Board has the authority to plan, construct and operate power-generation facilities, including hydropower. The Kaptai dam is currently the only source of hydropower in the country (BPDP 2010). USAID is investing in clean water facilities and disaster mitigation and readiness. The agency also conducted a study of the potential effects of climate change on Bangladesh’s water resources, and administers the Management of Aquatic Ecosystems project through the Community Husbandry (MACH) program. MACH aims to encourage environmentally sound utilization of wetlands (USDOS 2009; USAID 2006). The World Bank has partnered with the government to institutionalize participatory water management, strengthen water sector institutions, and maintain and improve operations of flood-control infrastructure. The World Bank engaged in the Water Supply Program Project (US $55.1 million, 2004–2010) to help Bangladesh meet the Millennium Development Goals for water and sanitation by 2015. Program goals included reducing the number of rural households dependent on arsenic-contaminated groundwater, as well as improving the delivery of water services in rural villages (World Bank 2008b; World Bank 2008c; World Bank 2009c). In addition to the World Bank, the Asian Development Bank (ADB), DFID, the United Nations Children’s Fund (UNICEF) and the World Health Organization (WHO) are actively involved in the water and sanitation sector in Bangladesh (ADB 2004b; World Bank 2006a). Forest land in Bangladesh can be classified in 3 categories: (1) tropical or semi-evergreen forest located in the hill country of the east; (2) moist or dry deciduous forest found in the central plains and northeastern freshwater areas; and (3) tidal mangrove forests located along the coasts. Of the total forest land estimated at 2.56 million hectares, about 47% is devoted to forest plantations. (Note that estimates for the current forested area of Bangladesh vary; while the World Bank in 2009 stated that 6.7% of the country was forested, the GOB states on its web site that 17% of the country is forested.) The remainder is natural forest and barren land. Much of Bangladesh’s forest land no longer has any forest vegetation as a result of cultivation, illegal occupation, and non-forest land uses (ADB 2004b; Biswas and Choudhury 2007; World Bank 2009b; GOB 2010). Bangladesh’s population relies heavily on forest resources. Trees supply timber for fuelwood and construction. The forests provide fodder for animals, grasses for thatching, medicinal plants, and essential oils. Bangladesh loses roughly 1.6% of its forest land every year. Forest land per capita is among the lowest in the world. Deforestation results from pressures of illegal logging, resettlement of people, natural disasters, extraction of resources, encroachment for agriculture and housing, use of land for state and military purposes, and inconsistent forest management policies (FAO 2008; ADB 2004c; ADB 2004b; Ahmed 2008; Biswas and Choudhury 2007). Formal law governing forests and forest products in Bangladesh are: the Forest Act of 1927 (as amended in 2000); the Private Forest Ordinance of 1959; the 1992 Forestry Master Plan; and the National Forestry Policy of 1994. The Forestry Policy seeks to bring 20% of the country’s land under the afforestation programs of the government and private sector by 2015. The Government of Bangladesh has outlined a three-dimensional approach to implementing the Forestry Policy: (1) people-oriented forestry programs; (2) forest production- directed programs; and (3) programs that strengthen institutions. The policy emphasizes the preservation and management of forests, plants and animals through a participatory approach with local residents. The policy encourages tree-cultivation by communities and supports local forestry and forestry-related businesses (FAO 2000; GOB MEF 1994; ADB 2004b; World Bank 2006b; Muhammed et al. 2008; FAO 2000; Choudhury 2003). The Forestry Master Plan is a macro forest plan designed to address policy issues, institutional reforms, and environmental concerns. The plan outlines five preconditions for the sustainable development of the forestry sector in Bangladesh: (1) the satisfaction of basic human needs; (2) continued socio-economic growth; (3) participation in decision-making and benefit sharing by those who use forest resources; (4) the sustained commitment of government to systematic long-term approaches to tenure issues; and (5) the sustainable utilization of forest resources (FAO 2000). Under the Bangladesh Private Forest Act 1959, the government can take over management of privately-owned forest land, land that could become forested, or land that has lain fallow for more than three years. The law allows the government to require private forest-land owners to develop and abide by forest management plans or risk loss of the forest land to the state (FAO 2000). Since colonial times, successive governments have declared increasingly large tracts of forest land to be reserved. Reserved forests come under the direct management of the government, and the government controls use of the forest resources. Government control of these forested areas has not necessarily led to more sustainable management of the resource (Roy 2004). Customary forest rights of indigenous people are enjoyed only to the extent that they do not conflict with state law. The tension between customary rights and claims by individual property-owners under statutory law have usually been resolved in favor of wealthy individual property-owners. There has been some formal or near- formal recognition of customary resource rights (such as timber rights in areas of prior timber use by local communities) but such recognition has generally not been implemented in practice. In some instances, customary rights to resources have been formalized and recognized in practice, such as indigenous people’s rights to minor forest produce (e.g., seeds, honey). Conflicts between indigenous people and the state over forest land are common. Indigenous people assert legal rights based on generations of forest access and use of forest products; the government often takes the view that indigenous peoples’ rights are actually privileges that can be revoked at will (Roy 2004). The Forest Department, which is within the Ministry of Environment and Forests, manages all government- owned forests. The department’s responsibilities include forest conservation and preservation, management of forest production, social forestry initiatives, and public outreach and education. The performance of the department has been poor; the department is perpetually understaffed, and forestry policy work generally has been consistently underfunded. That some department officials have allegedly been involved in and profited from illegal logging has reduced public confidence and support (ADB 2004b; Muhammed et al. 2008; World Bank 2006b). In 1989, due to a rapid annual deforestation rate of 3.3% in the 1980s, the Government banned harvesting of trees in primary forests on both public and private land. This moratorium resulted in a net annual reforestation rate of about 1%. The ban also led to development of private-sector timber production, which now produces over 80% of the locally harvested timber marketed in Bangladesh. The government has set a goal of 20% forest cover by 2015 (World Bank 2006b; ADB 2008; Mueller 2000). The government has also implemented agroforestry programs and social forestry in several areas. Agroforestry programs involve simultaneous agricultural and forest production on the same land. The program has been tried in both plains and hill areas. The government social forestry programs seek to create sustainable, forest-related employment, meet fuel and other minor forest product needs, promote soil and water conservation and make the forest areas more accessible for recreational activities. These programs have had modest success as demonstrated by some net reforestation in the 1990s (GOB MEF 2009a; GOB MEF 2009b; World Bank 2006b). In 2008 USAID awarded a five-year contract to International Resources Group (IRG) for the Integrated Protected Area Co-Management (IPAC) project. The project is designed to contribute to sustainable natural resource management and enhanced biodiversity-conservation in certain areas with the goal of preserving the country’s natural capital while promoting equitable economic growth and strengthening environmental governance (IRG 2008). The World Bank has supported forestry development projects in Bangladesh in cooperation with ADB. The Sundarbans Biodiversity Conservation Project was a 7-year joint project for implementing a sustainable management and conservation system for the Sundarbans region. The Upazila Afforestation initiative started in 1986 and ended in 1995. This program generated some positive environmental impacts, but was criticized for propagating certain exotic species (ADB 2004b; ADB 2004c; World Bank 1998). Bangladesh is not mineral-rich. The country has small reserves of coal and oil. Natural gas provides most of the energy consumed in Bangladesh. Natural gas exploration is ongoing, and evidence of larger reserves exists. The value of such reserves is potential grounds for conflict. In 2008, Myanmar undertook offshore exploration of deep-sea blocks of oil and gas in disputed territorial waters, leading to the mobilization of Bangladeshi and Myanmar war ships. Industrial minerals produced in small quantities include cement, granite and limestone (Bangladesh Embassy 2009; New Nation 2006; Kuo 2007). Article 143 of the Constitution provides that the Government of Bangladesh owns all the country’s minerals. The Mines Act of 1923 sets forth state powers of mine exploitation oversight, and establishes health and safety standards for operation of mines. The Mines and Mineral Resources (Control and Development) Act of 1992 governs the granting of mining licenses. The Petroleum Act of 1934 (as amended), gives the government the exclusive right to exploit petroleum resources, and extends the government’s petroleum rights to the country’s economic zone and continental shelf (GOB 1972; ADB 2004b; GOB 1992). The Mines and Mineral Resources Act empowers the government to grant prospecting licenses and mining leases to private parties to engage in mining, and includes provisions for payment of royalties by the mining entity. The government has rule-making authority. Individuals and entities that violate the rules may be subject to fines and imprisonment (GOB 1992). The Ministry of Power, Energy and Mineral Resources oversees mineral resource development in Bangladesh. 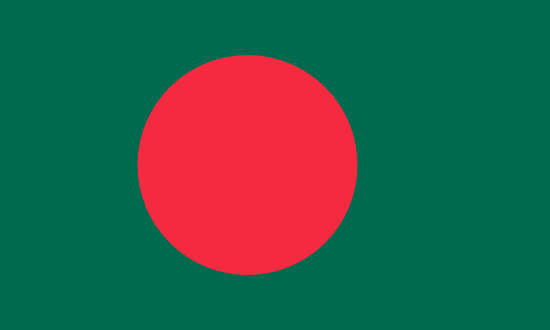 The state-owned Bangladesh Oil, Gas and Mineral Corporation (Petrobangla) is responsible for oil and gas exploration, production and distribution. It has also engaged in activities relating to other minerals, such as those required for the manufacture of coal and cement (Kuo 2007). The government seeks foreign investment in the energy sector and is adopting policies to promote that investment. The government offers special incentive packages to investors in oil and gas development. Incentives include tax exemptions or reductions, lower duties on imported equipment, no restriction on foreign equity participation, legal protection against nationalization, expropriation, and assurance of non- discriminatory treatment (Bangladesh Embassy 2009; CBB 2009). USAID has made no recent investments in the minerals sector. ADB has provided a US $230 million loan to Petrobangla to support development and construction of natural gas pipelines to deliver energy to areas of western Bangladesh (ADB 2005).